Welcome to The Garden Helper! The Garden Helper is a free gardening encyclopedia and guides to growing and caring for gardens, plants and flowers. Helping gardeners grow their dreams since 1997. Share your gardening knowledge with The Gardener's Forum - with 50,000 posts and thousands of participating members. There are twenty five species of Cosmos plants, but most nurseries will only handle the three most popular types. 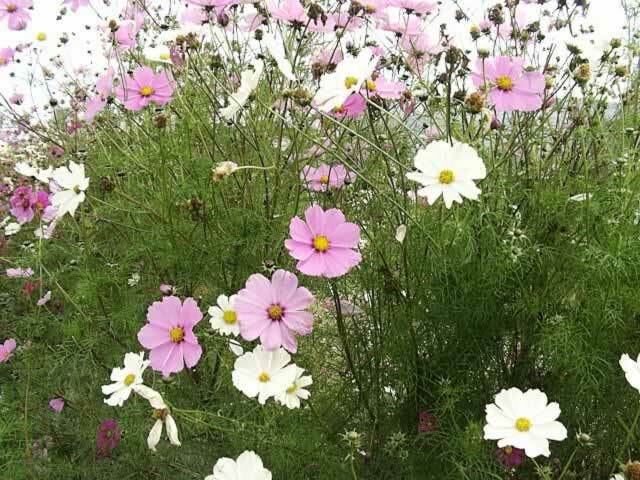 The annual Cosmos bipinnatus is often called a Mexican Aster and is by far the most common choice. Yellow Cosmos, Cosmos Sulphureus, is also an annual plant and has yellowish-orange flowers and may reach up to six feet by the end of the growing season. The Mexican Aster or Tall Cosmos is easily recognized by it's upright, feathery foliage and pastel colored flowers that encircle a bright yellow center from July until frost. These fast growers can easily reach a height of five feet. Cosmos bipinnatus should be planted 9"-24" apart in full sun and in poor, infertile soil. Water them well until established, then watering can be cut back drastically because these plants are extremely heat and drought tolerant. fertilizing is not recommended because although fertilizer will increase the foliage, it will also delay flower production. Cosmos plants reseed themselves readily. Cosmos plants are extremely easy to grow from seed. 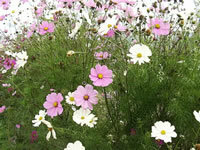 Cosmos seeds can be sown directly in the garden after all danger of frost has passed. You can also start your seeds indoors 5-7 weeks before planting them in your garden. Maintain the temperature within the growing medium at 68°-86° F.
Germination will take place within 5-10 days. The Garden Helper may not be reproduced or distributed for any purpose without our written consent.